December 13th is celebrated in honor of Saint Lucy, the young girl who according to legend died a martyr in Sicily. 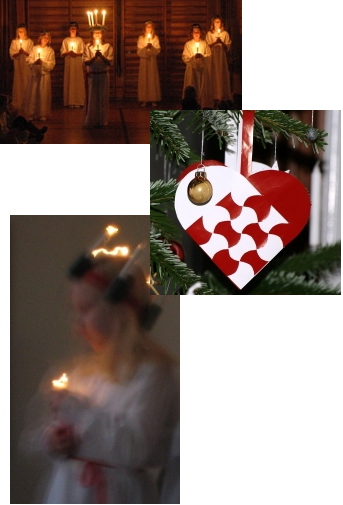 St. Lucia's Day is celebrated in other countries including Sweden. This day is celebrated in schools, day-care centers, nursing homes and hospitals, with processions led by a young Lucia in a white robe with a crown of lights on her head and a candle in her hand. In Norway, this night used to be called Lussinatten. It was the longest night of the year and no work was to be done. From that night until Christmas, spirits, gnomes and trolls roamed the earth. Lussi, a feared enchantress, punished anyone who dared work. Legend also has it that farm animals talked to each other on Lussinatten, and that they were given additional feed on this longest night of the year. During the midwinter feast in Norway, evergreen branches, mistletoe and holly were used long before the Christmas tree became a tradition. During the midwinter feast in Norway, evergreen branches, mistletoe and holly were used long before the Christmas tree became a tradition. Not until the first half of the 1800s did this German tradition come to Norway. Today the Christmas tree has a central place in the celebration of Christmas in Norway. The tree, a spruce or pine, is usually bought in town or chopped from one's own forest. It must be fresh and green and fragrant, with a good shape and thick branches. Outdoor Christmas trees put up on squares, in parks and other places where people walk are lit the first Sunday in Advent, but the tree in the home is not lit until Christmas Eve. Year after year the tree is decorated with homemade and bought ornaments. Norwegian children proudly present the decorations they have made at school and these are hung on the tree. All kinds of lights are sold, but nothing is more beautiful than tiny candles on a tree. They create a special atmosphere, but must always be used with caution. Christmas is a festival of lights and candle-making was one of the annual and necessary steps in the preparations for Christmas. The job was often turned over to the oldest people on the farm. All fat from the slaughtering was saved. The tallow was melted and strained. Tallow from small animals made the finest candles. Wicks were made of linen or hemp. Airing out was forbidden to prevent bubbles or crooks from forming in the candles. The candles would turn out better if the weather was good. The first batch of candles was the whitest and most beautiful and was therefore saved for holidays and parties. The way the candles burned on Christmas night presaged what would happen in the coming year. If a light went out it meant death for the person to whom the candle belonged. Even today making candles for the Advent wreath is a cherished tradition enjoyed by many.